You've probably seen lots of blogs that contain Facebook "like" buttons. If a visitor clicks on the button, an "I like this blog" post appears on their Facebook wall, visible to all their friends. This encourages their friends to visit the blog - and if these friends also like the blog, the result can be a viral cascade effect, driving loads of free traffic to the blog. It sounds like a perfect traffic solution. Few (if any) visitors ever actually click like buttons. ...unless you are using Viral Like Bot! 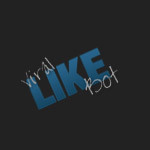 Viral Like Bot gives your visitors a powerful incentive to like your blog, by offering a special reward. 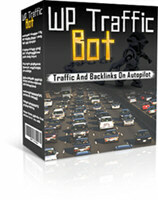 It can drive loads of traffic to your blog, while Viral Like Bot manages the whole process for you on autopilot. 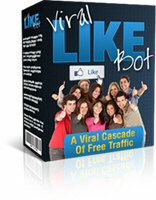 To use Viral Like Bot, you need a downloadable product that your visitors will really want. It can be an ebook, a course, articles, videos, software or anything else. Visitors to your blog will be offered this downloadable product free as a reward for liking your blog. Viral Like Bot manages the whole process for you. All you need to do is set it up (which should only take a few minutes) and then leave the software to handle everything on autopilot. Once you have selected a suitable reward product, you upload the product to your blog, along with the Viral Like Bot WordPress plugin. You just fill in the form and then click the Create button to instantly generate your plugin. There is also a special tool to upload the plugin and the reward product (or you can upload them using any other mechanism you wish). 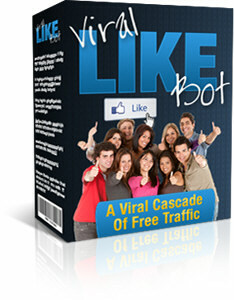 The Viral Like Bot plugin uses a special ad system that advertises the offer on all your blog posts and pages, encouraging people to like your blog. You can have an ad shown above or below the first post on each page, or have the ad shown as a "widget" in the side panel of the blog. You enter the title, text and image for your ad and select where it should appear. You can instantly see what the ad looks like, so you can adjust it until you're 100% happy with it. 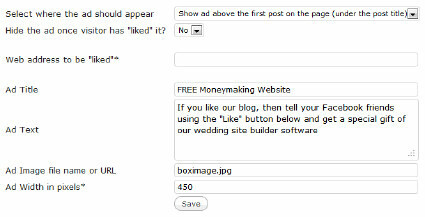 Your ad will then appear automatically on every part of your blog. The WordPress plugin is licensed for use on an unlimited number of blogs, so you can use it on every blog you own, without paying any extra. Traffic is the most valuable commodity for any online business. A lot of people pay big sums of money for Search Engine Optimization, Pay-Per-Click and other sources of traffic. And they keep on paying again and again. Viral Like Bot offers a unique alternative. There is no ongoing cost or effort. Just a single quick and easy setup - and then you leave the system to continually drive free traffic to your blogs on autopilot. With such powerful benefits, you might expect to pay a lot for this superb software. But if you order right now, you get your copy for the low price of just $19.95. 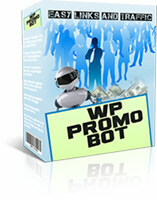 Viral Like Bot is one of our three powerful WordPress traffic plugins. With our special offer, you can get all three plugins together at a special discounted price of 50% off. 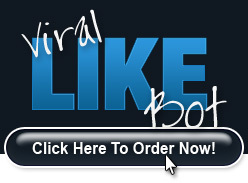 If you've decided NOT to order the 50% Discount Special Offer, you can order Viral Like Bot now for just $19.95 using the button below.